I cannot still understand why 'American Football' or simply 'Football' as its called in North America, is so called when there is no connection between the "foot" and the "ball" during the entire duration of the play. For me 'Football' will always mean 'Soccer' (where the the ball and the player's foot are together for major part of the game). Lil Sid will vehemently protest. I guess that's the 'generation gap' that I'll have to live with, for raising my kid continents apart from where I was raised. Coming back to 'American Football' and the Super Bowl craze. I am sure everyone knows about 'Super Bowl' and its gripping 'fever'. But for the uninitiated, its "the annual championship game of the National Football League (NFL), the highest level of professional American football in the United States, culminating a season that begins in the late summer of the previous calendar year." (Source: Wiki) So the Super Bowl XLVIII, which was played on Feb 2, 2014 was the finale of the season that stared during late summer of 2013. This year we were invited for a Super Bowl party at a friend's house. Our first. I was super excited. With my inbox flooded with chili recipes, I volunteered to bring some "Chicken Chili". 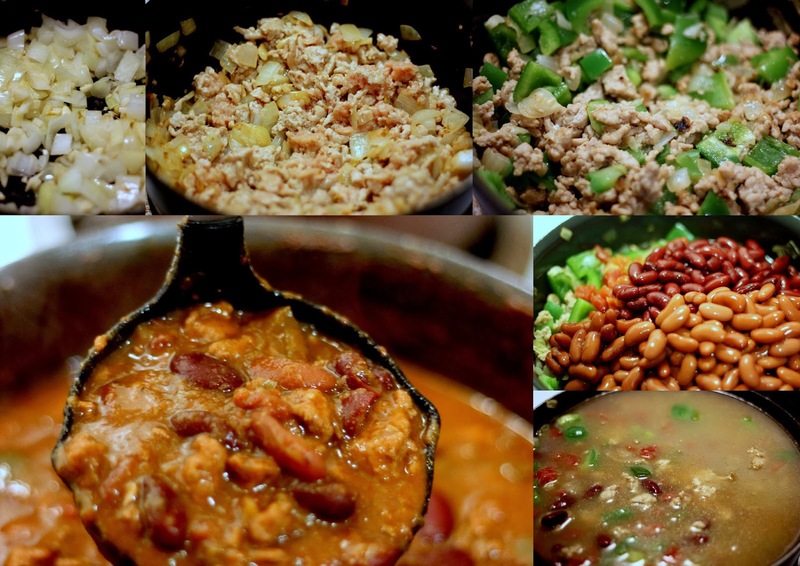 I feel Chicken Chili is just a Tex-Mex cousin of our own 'Keema-Rajma' (Indian style ground chicken and kidney bean curry). The spices are pretty much similar, though the cooking process is a little different. Thought I have made 'Keema-Chole' and 'Keema Rajma' many times, I was a little skeptical of how the Tex-Mex version would turn out. So I decides to make it one night for dinner and it would also be a 'Dry-Run' for the Super Bowl party the following weekend. It turned out to be fabulous. The best thing was that Sid also enjoyed it. He particularly loved the Corn Muffins that I made to go with the Chili. The combination of the Chili with the soft 'a little sweet-a little-savory' muffins was heavenly. The 8-cup rectangular muffin tin (also called mini loaf pans) was my Christmas gift last year and this provided the perfect opportunity to use it for the first time. The Corn Muffins really looked fancy. The recipe below would yield 12 standard muffins, but for me, it was only 8. I have always felt like our Ghugni or Indian Chaats, the toppings that go on the chili are the real star that either make or break a good chili. The most common toppings are shredded cheese, sour cream, guacamole, tortilla chips, finely chopped scallions or chives. For our homely dinner me and Sam went with avocado slices, shredded sharp cheddar cheese, sliced pickled jalapeno (to make up for the lack of heat in the main chili) and a big dollop of Greek yogurt. Sid stuck to shredded cheese only. 1. In a big stock pot, heat 2 tbsp of oil on medium heat and saute the minced garlic and diced onions till soft. 2. Add the ground chicken (I used the lean ground chicken breasts), breaking then into smaller bits with the spatula. Stir it continuously, till its thoroughly cooked. Around 6-7 minutes. 3. Add the bell pepper and mix well. 4. Now add the beans (I used a mix of dark and light kidney beans. Black/ Pinto/ Navy beans can also be used). 5. Add the spices - cumin, oregano, paprika (or red chili powder), salt, brown sugar, cocoa powder (for that rick dark color. Avoid if not convinced.) and mix well. 6. Add the chicken stock (a combination of white wine and chicken stock or beer and chicken stock can also be used for variation) and bring to a boil. Reduce the heat and simmer(with the lid on ) for an hour and half. 7. After an hour an half, check and adjust seasoning. Its always advisable to add less salt initially. 8. Ladle into serving bowl and garnish with cilantro/parley, sour cream, guacamole (or avocado slices), shredded cheese and jalapenos. After Step 3, dump the beans, spices, sugar, salt and the cooked chicken , onion, and bell pepper and the chicken stock in a slow cooker and cook on 'low' for 8 hours. 2. 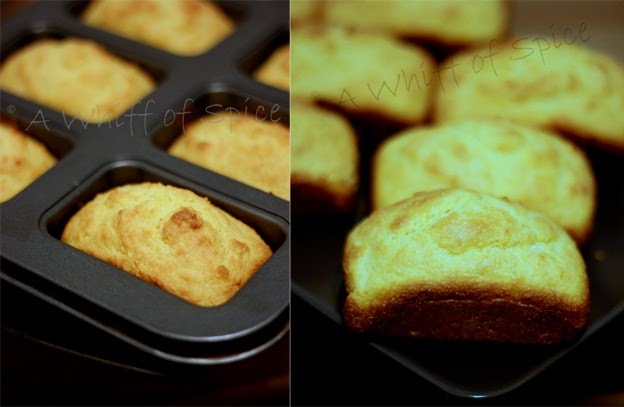 Grease a 12 cup muffin tin. I used a 8 cup rectangle muffin tin. 3. Shift together the AP flour, cornmeal, baking powder, baking soda,salt, pepper, garlic powder and paprika. 4. In a separate bowl, mix together the eggs, oil, buttermilk and sugar Whisk well to get a homogeneous mixture. 5. Add the liquid ingredients to the dry ones and mix just until just combined with no dry spots. The batter should be visibly lumpy. It's extremely important not to over-mix the batter. 6. Fill the 3/4 of the muffin tin and bake in the preheated oven for 20-25 mins or until the top is golden brown and tester inserted into the middle of the muffins comes out clean. 7. Remove the cornbread from the oven and serve warm with the Chicken Chili. A meal of heart healthy beans and lean protein is always a superb option for a diabetic. So is the case with this chili. A bowl of this chicken chili and one corn muffin would be a really balanced meal, with the right amount of carbs, fiber and protein. The only thing to keep in mind that the topping are not always diabetic friendly. Instead of sour cream, use non fat Greek yogurt. Avoid the tortilla chips and instead of a high caloric guacamole, use few slices of avocados. Chicken chilli and corn muffins look simply mouthwatering.